This profound ethnographic documentary explores the myriad of ways in which centuries-old indigenous knowledge is rapidly vanishing throughout the world. The film focuses on the southern Mexican village of Talea, Oaxaca. For half a century, the Zapotec people of this region have experienced rapid modernization: The creation of a road linking the village to cities, the arrival of electricity, and the introduction of computers and Internet have all transformed the texture of daily life. However, the people of Talea have often experienced “progress” as a double-edged sword. 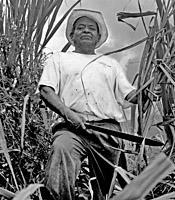 Farmers are now able to export coffee and other cash crops, but many of their children have migrated to the United States and today, fertile fields lay abandoned. Governance was once a village affair, but state and national government has disrupted and sometimes displaced local political autonomy. Most new buildings in Talea are constructed with imported concrete, not with regional materials. And traditional healing practices are rapidly being displaced by Western biomedicine. By exploring the transformation of agriculture, governance, architecture, and medical practices in the village, filmmaker/anthropologists Laura Nader and Roberto Gonzalez pose a series of provocative questions: Is it possible that 50 years of “development” has done more to unravel local culture than 500 years of conquest? What are the long-term implications of the knowledge that has been lost? Is there any possibility these processes might be reversed? The film also examines how disappearing indigenous knowledge isn’t just a Zapotec problem. It is a global problem, for throughout the world, local knowledge developed over centuries — a priceless intellectual treasure trove — is withering away at an alarming rate. Losing Knowledge is both insightful and poignant. It will engage students and engender thought and discussion in a wide range of classes in cultural anthropology, Latin American studies, development issues and economics, and third-World studies. It was produced and directed by Laura Nader (University of California, Berkeley) and Roberto Gonzalez (San Jose State University).